The Giants waived Clay (ankle) from injured reserve Tuesday, per the NFL's transaction log. Analysis: Clay was reverted to IR after clearing waivers on Sept. 26. Mostly used on special teams, the 26-year-old wideout out of Utah has just six receptions for 85 yards for his career. Clay (ankle) cleared waivers Wednesday and shifted to injured reserve, per the NFL's official transaction log. Analysis: Before his injury, Clay was used strictly on special teams, and he has just six career receptions over four years. He'll be sidelined for the remainder of the season unless he's released with an injury settlement. The Giants waived Clay (ankle) on Tuesday with an injury designation, Paul Schwartz of the New York Post reports. Analysis: Clay never looked to be long for the New York roster after the team picked up another depth wideout in Stacy Coley last week on a waiver claim. 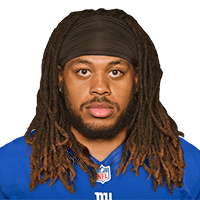 The Utah product ultimately sat out the Week 3 win over the Texans with the ankle issue, so he'll remain in the organization and revert to the Giants' injured reserve list if he goes unclaimed off waivers by the other 31 teams. Clay (undisclosed) is ruled out for Sunday's game against the Texans, Jordan Raanan of ESPN.com reports. Analysis: Clay suffered an ankle injury during the team's loss to Dallas, but the reason for his being sidelined during Week 3 remains undisclosed. In Clay's absence, Odell Beckham or Sterling Shepard could see work returning punts against the Texans on Sunday. Clay was sidelined with an ankle injury in Sunday's 20-13 loss to Dallas. Analysis: The severity of Clay's injury remains unclear and his practice status this week will give a better indication of his health. His absence doesn't impact the Giants offense greatly, as his role is primarily as a punt and kick returner. 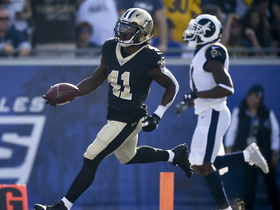 Clay was claimed by the Giants off waivers Sunday after being let go by the Bills, Jordan Raanan of ESPN.com reports. Analysis: Clay was picked up mostly for his return skills, so he'll get another chance to make a quick impression and prove to the Giants he's worth a roster spot instead of using one of the current batch of return guys. Clay was part of Saturday's roster cutdown, John Murphy of the Bills' official site reports. Analysis: The Bills ended up going with rookies Robert Foster and Ray-Ray McCloud to fill out their final receiver spots. Clay always offers up a lot in the return game, but he's pretty much a one-trick pony at this stage of his career and the Bills have enough other options to return kicks. Clay (ribs) participated in Bills practice Monday, Joe Buscaglia of WKBW.com reports. Analysis: Clay missed only one day of practice due to the rib injury. This is good news for the 26-year-old, whose chances of making the 53-man roster are dependent on standing out at training camp. Clay looked better as a return man than as a wideout in the 2017 season, fielding 17 punts for 147 yards and a touchdown, and could see his future usage reflect that. 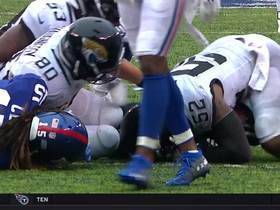 Clay (undisclosed) was unable to practice for the second straight day Sunday after leaving Friday's practice early after taking a hard hit, Chris Brown of the Bills' official site reports. Analysis: If Clay makes the team, it likely will be due to his capabilities as a return man, but the Bills also have a host of other options, so any significant missed time could prove costly toward his roster chances. Clay (undisclosed) left practice Friday after taking a hard hit during the two-minute drill, Matthew Fairburn of The Athletic Buffalo reports. Analysis: Clay was used sparingly in 2017, notching six receptions on 20 targets for 85 yards and zero touchdowns in 13 games. He has potential as a return man, however, fielding 17 punts for 147 yards and one score, while recording 53 yards on three kick returns. The Bills will sign Clay, Mike Rodak of ESPN.com reports. Analysis: Clay, who was with the Bills for a portion of last season before landing with the Panthers, returns to Buffalo to provide the team's wideout corps with added depth behind Kelvin Benjamin, Zay Jones and Andre Holmes. Moreover, Clay can also contribute on special teams after returning 17 punts for 147 yards and a TD in nine games for Carolina in 2017. Clay didn't receive a qualifying offer or minimum tender from the Panthers and will become an unrestricted free agent, per the league's official transaction log. Clay finished with five receptions (on 15 targets) for 57 yards and rushed twice for 27 yards in nine games for the Panthers this season. 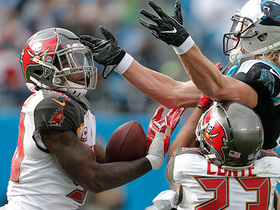 Clay caught two of four targets for 24 yards in Sunday's 22-19 win over the Buccaneers. Analysis: Clay's receiving performance was his best since joining the Panthers, which isn't saying much. Although it's good to see him getting more involved, his fantasy value remains rather restricted ahead of Week 17's trip to Atlanta. Clay (shoulder) is listed as active for Sunday's game against the Vikings. Analysis: Clay was unable to practice Wednesday before logging limited sessions Thursday and Friday due to his minor shoulder injury, but the Panthers' punt returner will be able to take the field Sunday. His fantasy value remains limited, however, as he's notched just three receptions all season. Clay is listed as questionable for Sunday's game against the Vikings with a shoulder injury. Analysis: The injury prevented Clay from practicing Wednesday and rendered him a limited participant in sessions Thursday and Friday. Clay has logged more than 20 offensive snaps in each of the past three weeks, but has only been targeted five times in that span, hauling in two receptions. It may not be long until Damiere Byrd, who was activated from injured reserve ahead of last week's loss to the Saints, passes Clay up for the No. 3 spot on the depth chart at wide receiver. 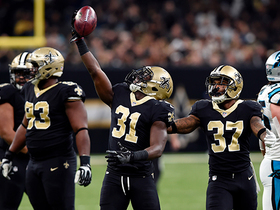 Clay caught his lone target for a 12-yard gain in Sunday's 31-21 loss to the Saints. He also lost a fumble on a punt return during the fourth quarter. Analysis: Clay returned a punt for a touchdown last week, but he committed a costly error on special teams this time around. Clay's 13 receiving yards were his most since joining the Panthers, but his spare usage in the passing game severely restricts his fantasy utility. Clay rushed once for 29 yards and failed to haul in any of his three targets, but he returned a punt 60 yards for a touchdown in Sunday's 35-27 win over the Jets. Analysis: Clay didn't connect with quarterback Cam Newton, but his versatile skill set figures to serve him well with rookie Curtis Samuel sidelined for the remainder of the season. After flashing his shiftiness on a punt return and handoff, Clay will look to get more involved in the passing game Sunday in New Orleans. 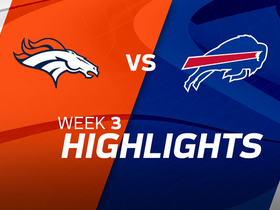 Clay caught his lone target for five yards in Monday night's 45-21 win over the Dolphins. 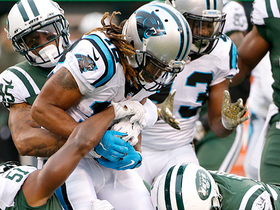 Analysis: Clay hauled in the lone look his way, giving him his second career reception, but the 25-year-old could be in line for more snaps now that Curtis Samuel (ankle) has been ruled out for the season. While Brenton Bersin knows Carolina's playbook better, the shifty Clay sits ahead of him on the depth chart, trailing only Devin Funchess and Russell Shepard at the moment. Kaelin Clay muffs punt at critical moment, Jacksonville Jaguars recover. Carolina Panthers quarterback Cam Newton throws the ball straight to Atlanta Falcons safety Ricardo Allen for the interception. 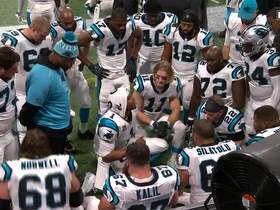 Carolina Panthers quarterback Cam Newton gathers his entire offense on the bench and tries to get them fired up. New Orleans Saints safety Chris Banjo forces a fumble on a kick return. 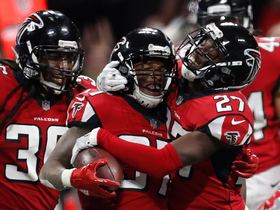 Check out the best plays from Sunday's Week 12 action from around the NFL. 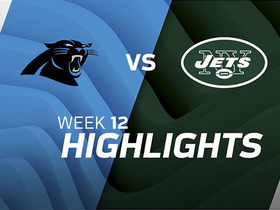 Watch as the Carolina Panthers take on the New York Jets in Weel 12. 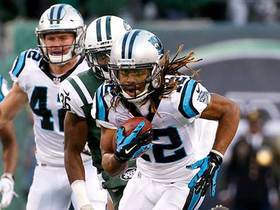 Carolina Panthers wide receiver Kaelin Clay spins off the first defender and takes the putn return 60 yards down the sideline to the house. Carolina Panthers QB Cam Newton fakes the hand-off and gets it to wide receiver Kaelin Clay for the end-around run for a big 29-yard gain. Watch highlights of the Denver Broncos versus the Buffalo Bill from their Week 3 mathcup of the 2017 season.